You can connect a laptop, Mac and pads to the systems in most AV-rooms. You will find the connecting cables hidden in table sinks with lids. Some rooms may have multiple sinks and cables. 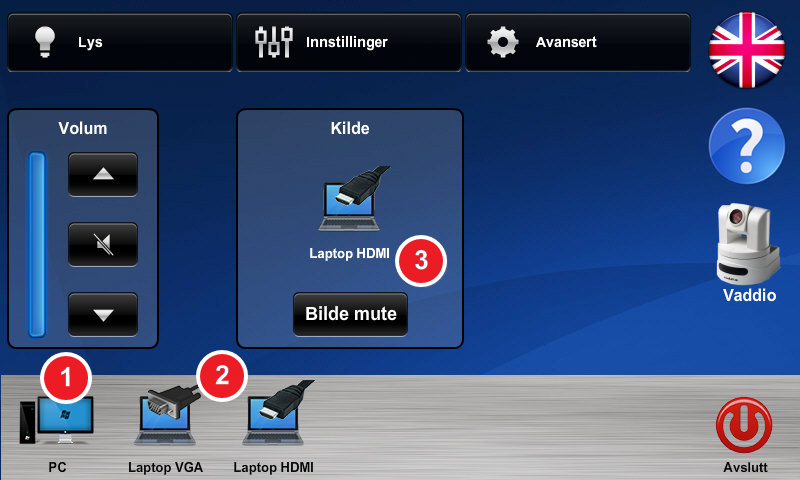 When the laptop is connected, you select the proper unit in the Control panel to share its screen and content onto the big-screen/smartboard. Take note that the camera(s) in the room does not send videosignals to equipment connected in this manner - only to the table mounted PC. A HDMI-cable is the only available option in this setup. The VGA-cable will in many cases require a adapter, as most modern laptops no longer sports this type of connector. Hook the Mini Jack up to the unit's audio-out to send sound out to the room. Remember to adjust the laptop's internal volume controls. PC is the go-to standard setting for the Control panel on startup. Click here to re-select PC if necessary. Click one of the other choices to select a connected unit, using the cable-identifier as your guide. Take note that if there are multiple table sinks, the cables should be marked with numbers that will correspond with numbers found in this menu. Pads and other devices kan be selected in the same way, as long as it is connected with an suitable adapter and its screen is shared with the system. The connected unit is not sharing its screen! On the keyboard, hold the Windows-key+ P-key. From the pop-up menu: click Duplicate (or Dupliser, if in Norwegian). Go to the Apple-menu > System Settings > Displays and select Display. Make sure that the display is set to the same resolution as the big-screen/smartboard. Click Organization and then select Matching displays.